MURDEROUS MATHS - "Latest updates"
Even though we spend most of our time playing around with shapes and sums in the Murderous Maths Organisation, we are aware that there's a bigger world out there and occasionally we like to show little things that interested us in the "Latest Updates" section of our website. Some of the bits that have been and gone are reproduced here just for fun! They collect all the top news, best stories, off-beat opinions and sneaky gossip from all over the planet and pack it into neat little chunks so that we can read it without getting utterly muddled. We love it. If you're interested in the news then you can get trial issues of the week from The Week Website. FUN FACTS - if you like maths trivia then look out for the flashing green light. Spell out the numbers in the magic square on the left. Count the letters in each number. 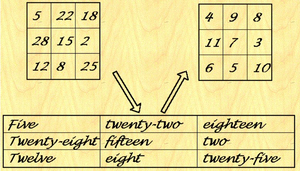 It produces ANOTHER magic square! The Day of the Huntrodds! The curious old Whitby couple who were born, married and died on the same date - but what are the chances? That is AWESOME! Pointless, but awesome. That's how we like it. Many thanks to EDDERIOFER who sent this into our mailroom June 2017. 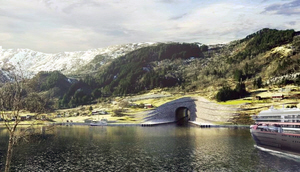 Norway is planning to build the world's first tunnel big enough for ships! It will go through the Stadlandet Peninsular to provide a shortcut which avoids having to sail the long way round a dangerous stretch of coatstline. 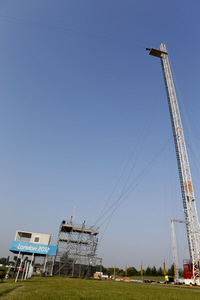 Height = an awesome 49m ! Here's a message to our Norwegian friends ... Lykke til! We read this in The Week April 2017. Back in 1983 a seven-year old boy spotted "James Bond" at Nice airport. 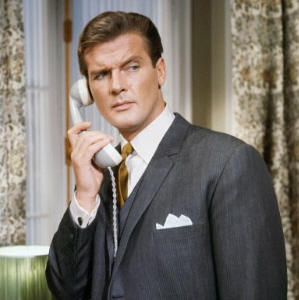 He asked his grandfather to get the agent's autograph, but when the old gent came back the boy was disappointed to see the signature "Roger Moore". "Tell him he's signed it wrong," said the boy. The grandfather went back to explain, and then the agent beckoned the boy over. "Shhh!" he said. "I have to sign my name as Roger Moore because otherwise Blofeld might find out James Bond was here. Don't tell anyone, and thanks for keeping my secret." Thanks for showing us the true meaning of "star". When a six year-old girl in the US asked her parent's new gadget to "play doll house with me", a brand new doll house was delivered from Amazon a few days later costing the family $150. The story was on the local news, and when the presenter repeated what the girl had said, several other Echo devices in other houses heard it and also ordered doll houses! We read this in The Week Jan 2017 One Trillion Replies! A computer technician in the UK's NHS service accidentally sent a test email to 1,200,000 other workers - and dozens of them hit "reply all". In total over 186 million emails were sent, blocking up the system for eight hours. It could have been worse... if everybody had hit "reply all", then that would have generated 1,440,000,000,000 utterly pointless emails. Thank goodness it couldn't have happened back in the good old days of letters, envelopes and stamps! We read this in The Week Nov 2016 The Long Crawl! Canadian mathematicians have worked out the shortest route to visit 24,727 pubs in Britain! It includes pubs on the Scottish Islands, Northern Ireland and the Isle of Man - but there's a tiny problem. One of the pubs they missed out is the Duke of York in Whitby. How careless. A plane was delayed for 2 hours at Philadelphia after a lady got worried about the man next to her scribbling strange numbers and symbols into a book. The aircrew escorted the man off the plane only to discover he was a famous maths professor doing some differential equations! He was allowed back on the plane, but the lady still didn't trust him so she caught the next one. That's more than � trillion - enough to buy the USA! Giles works on the railways and reckons it would take him 369 million years to pay it off. When he phoned to complain, the tax lady said "I think someone must have fallen asleep on the keyboard!" 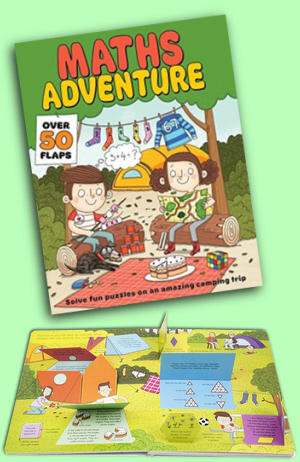 7 action-packed spreads with little flaps to open! Puzzles, numbers, symmetry, coins, nets, shapes ... it's all in here printed on chunky cardboard. If you visit Folkestone in Kent, UK, look out for some really unusual clocks. Back in 1793 France tried to use decimal time which has 10 hours in a day, 100 minutes in an hour and 100 seconds in a minute. (So at midday, a decimal clock says "five o'clock"). This divides the day into 100,000 seconds compared to the usual 86,400 seconds. As quick as a ... what? * In Suffolk you can buy t-shirts saying "You can't hurry me. I come from Suffolk." If you're in a hurry, what's quicker? "In the blink of an eye" "at the drop of a hat" or "as fast as a bat out of hell"? Thankfully researchers from Suffolk* have done some calculations. But if you really want to whizz along, you need to go at the speed of light = 300,000,000 m/s. Suppose you jumped into a tunnel going right through the middle of the earth. Canadian scientist Dr Alexander Klotz has worked out it would take you 38 minutes to reach the other side! But before you try it out, be warned. Your top speed will be 18,000 mph and you'll pass through layers at a temperature of 7,000ºC ! We read this in The Week April 2015. An Indian lady was just about to get married when she decided to give her future husband a simple maths test. Lovely Singh asked her groom "what is 15+6?". When he answered "17", she immediately cancelled the wedding and handed all the presents back! Never mind Lovely, you'll find enough sums on this site to keep you happy ever after. We read this in The Week March 2015. It's supposed to be impossible! Have a happy PI day on March 14th! Enjoy it because it's never happened before and will never happen again! Thanks to Jangwoo Lee who sent us this! 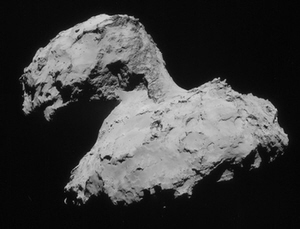 November 12th 2014: Rosetta's lander Philae touched down on a comet which is 4km across and travelling at 135,000 km/hour. Rosetta set off on March 2nd 2004, then to get speed up she swung past the Earth, then Mars, then past Earth again two more times. Then she went to sleep for 31 months as she shot into deep space, before waking up near the comet. It's a bit like firing a gun, letting the pellet bounce off a few fairground rides and then hitting a rubber duck strapped to a motorbike driving round the moon. That's what we call really murderous maths! 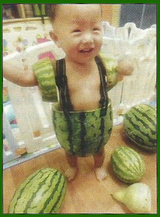 Ruifeng Fan from Taiwan made some watermelon pants for his five-year-old son to keep him cool! 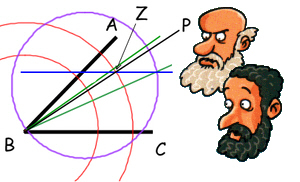 Our fashion-conscious Pure Mathematicians are sooooo jealous. In 2001 the artist Martin Creed won the �,000 Tate Gallery prize for some "art" which they then bought off him for another �0,000. It was called Work No. 227: the Lights Going On and Off. It was just some lights going on and off in a room. You can buy his new Work No. 127: the Lights Going On and Off for �,000. Of course you don't get a room, or any lights...or even a switch. You just get a certificate giving you permission to use the idea. You probably also get another certificate saying you're completely bonkers. our little flashy lights free of charge. Three students from New York State bought an old sofa for $20, then found $40,000 stuffed down the back! They traced the money back to a 91-year-old widow who's relatives had given the sofa away not realising her life savings were hidden in it. We offer our BIG RESPECT to the students who returned every penny! ...but 10% of ALL the pictures ever taken were shot in the last 12 months! Many thanks to Jangwoo Lee who told us that zenzizenzizenzic means "to the power of 8". It's a word that was used in 1557 based on zenzic which means "to the power of 2", therefore zenzi-zenzi-zenzic is "to the power of 2 x 2 x 2". You can also have zenzicube which is "to the power of 2 x 3" - in other words "to the power of 6.". If you're having a dull conversation that needs spicing up, try dropping these in! Good luck. This lifesize picture of King Henry VIII was found painted on the wall of a 16th century house in Somerset, England. But not everybody was happy that he'd made himself Head of the Church of England! If you look at it upside down (or through a wine glass) you see something else! The Dearest Thing On Earth! This is the Treskilling Yellow. 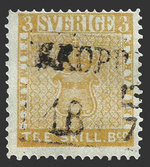 It's a Swedish stamp that was supposed to be green. It's so rare that back in 2010 it was sold for �600,000! This makes it the most valuable thing in existence by weight and volume. It weighs just 0.02675g, which works out at �bn per kg. 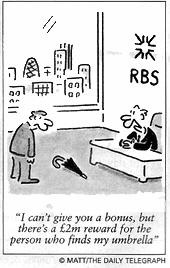 We are big fans of the cartoonist MATT. Here are two ways that he suggests bankers pay each other. 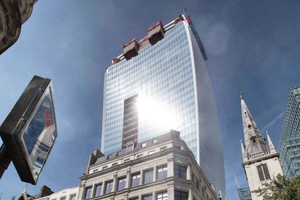 A new 37 storey building in Fenchurch Street, London is nicknamed the "Walkie Talkie" because of its shape, which is curved in such a way that it catches the sunlight and focuses it into a hot beam. It has damaged cars, melted plastic bottles and food packaging, and set fire to a man's hair who was using a nearby cashpoint. But it's not all bad news - some people have managed to use it to fry eggs! 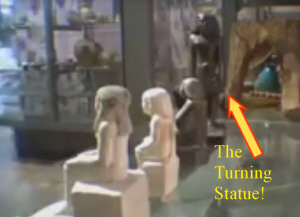 There's an Egyptian Statue locked in a glass case in Manchester Museum which turns round on its own! The 25cm high figure of Neb-Sanu has been filmed as it slowly revolves 180º to face away from the public, then somebody has to unlock the case and turn it back again! Some people think tiny vibrations are making it turn, others think it is an ancient Egyptian curse! But WE think that the statue isn't moving at all. It's the rest of the museum that's spinning round underneath. 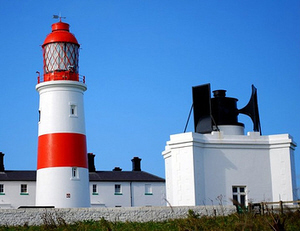 Souter Lighthouse in South Shields hasn't flashed its light since 1988, but now it's got a new job. In June 2013 it will be surrounded by three brass bands, while out at sea 30 boats will be blasting their sirens. The lighthouse will join in by blowing its FOGHORN! Whoever thought of this has our huge respect. We LOVE it. We just found out why Justin Bieber was TWO HOURS late going on stage at the O2 in London. 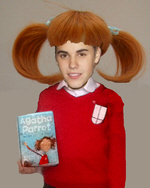 He was sorting out his costume for World Book Week! So it turns out that he's not a selfish little nosebleed who needs his bottom spanked after all. Therefore let's all give him some RESPECT. It's long, it's boring and it's VERY useless ... and WE LOVE IT! It's the 48th Mersenne Prime! It was discovered on Jan 25th 2013, and it's 17,425,170 digits long, so if you printed it out in a font big enough to read it would be about 30 miles (50 km) long! In Roald Dahl's book James and the Giant Peach he says the peach is the size of a small house and it could be lifted by 501 seaguls. However students at Leicester University have calculated it would take 2,425,907 seaguls to lift a peach that size. You wouldn't find a mistake like that in a Murderous Maths book! We read this in THE WEEK January 2013. The Oldest Kid in the Class! Anna Eriksson of Sweden was a bit surprised to be offered a place at her local primary school because she is 105 years old! We read this in THE WEEK December 2012. 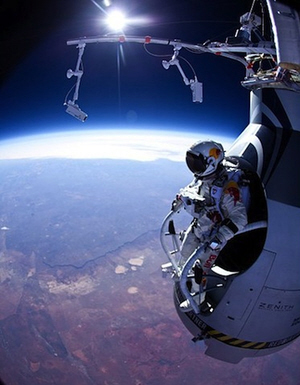 The Man Who Jumped From Space! who left us to join the stars 9/12/2012. Incidentally, the Murderous Maths PIN number is 1416. We'll give you slightly more than three guesses why...? Kesho was aged 13 and his brother Alf was nine when they were re-united at Longleat Safari Park after three years apart. They recognised each other instantly and hugged each other, shook hands and shrieked with delight - even though Kesho had grown into a 35 stone silverback. 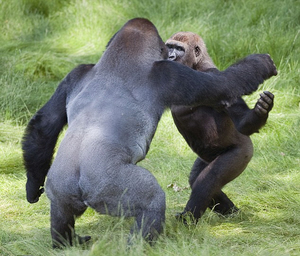 Apparently gorillas can recognise each other by the shapes of their noses! We had a fabulous time watching all the running, cycling, kicking, jumping, sweating, bashing, swimming, fencing and big people throwing things at the 2012 Olympics, but our FAVOURITE thing was hanging over the rowing course on Dorney Lake. It was the longest cable camera in the world! 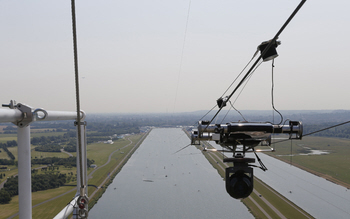 Each end of the course had a tower 95m high, and strung between them was a cable 2,500 metres long. (That's over a mile and half!) Hanging off this cable was a tv camera. The rope was so long that it dipped down to a height of just 8m in the middle. The camera could whizz along following the boats, then when it got to the end it shot back at 70 km/h ready to film the next event! 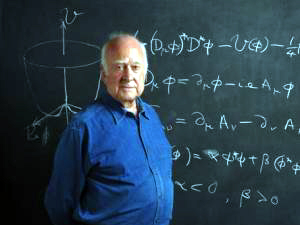 Higgs Boson Particle on eBay - WARNING! 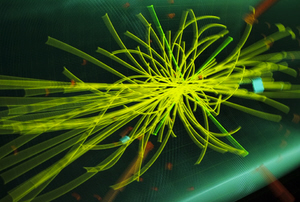 Scientists in Switzerland playing with their Large Hadron Collider are now 99.99995% sure that they've found the Higgs Boson particle. This is a teeny little bit of an atom that gives us mass - in other words it's what makes you heavy. Of course, now that they've found the HB, everybody is going to want one, so if you see one for sale on ebay, make sure it weighs about 125.3 gigaelectronvolts. If it doesn't then somebody is trying to sell you a fake. To finish with, here's a nice picture. It's the sort of thing that you always see next to stories about the Hadron Collider, but don't worry if you don't know what it is. Neither do we. We offer our big respect to Graham Eccles who has started his own postal service around Bude in Cornwall! 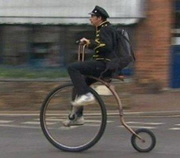 When the price of Royal Mail stamps went up, he decided to sell his own stamps for 25p each, and then delivers the letters around the town on his penny-farthing bicycle. We can't wait to see what he does when somebody wants to send a letter by air mail! Which Football Team Should You Support? 1/ Which team won the FA trophy on May 12th 2012? 2/ Which team is causing a major panic with all the bigger clubs by qualifying to join the football league next year? 3/ Which team is getting a brand new stadium? 4/ Which team has made the most appearances at the new Wembley Stadium? Amazingly, there is only ONE TEAM that satifies all these criteria. Q.E.D. The Lift into Space! The Obayashi corporation of Japan says that by 2050 they will be able to build a lift shaft 60,000 miles (96,000 km) tall! Earth's diameter is only about 8,000 miles (12,700 km) so it'll look like a needle stuck into a pea. The lift would carry 30 people and would move at 125 mph (200 km/hour) and would take about 3 weeks to get to the top... if it doesn't get stuck! February 21st 2012 will be NATIONAL PALINDROME day! On the 21st of February 2012 the date can be written as 21/02/2012 - so the digits read the same forwards as backwards! So go on, have a think...what will be the date of the next National Palindrome day? This only works with the date written in the DD/MM/YYYY format. If you use the MM/DD/YYYY format then the 21st of February is written as 02/21/2012 so this doesn't work. Sorry. HAPPY 2012 to all our visitors... starting with people in SAMOA and TOKELAU! People in the Pacific Islands of Samoa and Tokelau have missed out December 30th 2011, so their new year is arriving unexpectedly early! They can do this because they live very close to The International Dateline. Up until Dec 29th 2011, they were on the same side as America. This meant that their date was always a day behind Australia and New Zealand with whom they do a lot of business. Therefore they have decided to "catch up" by moving the date line! If this makes your head spin, the date line is all explained in The Murderous Maths of Everything - including how you can make your birthday last twice as long! We offer our big respect to a judge in Huelva, Spain. Every year there's a Christmas festival which involves "the three wise men" throwing sweets into the crowd. When a woman recently complained that a sweet had hit her in the eye, the judge refused to do anything because... The three kings were foreign dignitaries from an unspecified land, and so beyond his jurisdiction. In other words, he didn't want to make it harder to stage the festival in future years because of one sweet! We read this in The Week December 2011. The weight of an e-book! According to Californian Professor John Kubiatowicz, adding extra books to your Kindle or other e-reader makes it heavier! When the memory is empty, the electrons can just float about, but when the memory fills up the electrons are held in position. Einstein's formula E=MC2 tells us that the energy needed to hold the electrons increases the weight! So if your 4GB memory is full of books, the extra weight will be about 0.000000000000000001 of a gram. Mind you, the real books would weigh about two tonnes! The barman said "Sorry, we don't serve neutrinos." If you抮e not rolling about laughing, you have to know that a neutrino is the tiny little particle that scientists supposedly got to move faster than the speed of light in the recent CERN experiment. In theory this could make time travel possible. Got it now? Ha ha ha! The Russian Prime Minister Vladimir Putin has amazed archeologists by finding two ancient Greek vases while scuba diving in the Black Sea. Hmmm... they were only 2 metres down and suspiciously clean. As the vases were supposed to been there for over 1,400 years, wasn't he lucky that nobody else had found them before him? This is the most amazing thing we've heard of since North Korean leader Kim Jong-Il got five holes in one on his first ever round of golf. DO YOU FEEL LUCKY? is listed as "my favourite book" by statistics expert Professor David Spiegelhalter at Cambridge University! Visit THE BROWSER to see what he said. Hello Handsome! Photographer David Slater was visiting the Indonesian Island of Sulawesi when he left his camera unattended. This rather stunning crested black macaque grabbed it and took hundreds of shots including these superb self-portraits! Love-struck Jan Rudnicki of Poland tried to win the heart of Gosia Domoslawsha by riding into her house on horseback. One evening she was watching tv when she heard a huge crash and suddenly this half-naked man appeared in her front room. "I never fancied him before and I certainly don't now," she said. Mr Rudnicki is facing 5 years in jail for breaking and entering. It even makes Pongo McWhiffy's attempts to woo Veronica Gumfloss look cool! Which company is the largest manufacturer of TYRES? They make 306 million tyres every year for all their little cars and trucks. They have also made 4 billion little people which is well over half the human population of the world! A hopeful accountant from Somerset thinks this jelly bean has the face of The Dutchess of Cambridge on it! (She used to be Kate Middleton before she married Prince William.) He hopes to sell it for �0 to a "collector". We can't help wondering what kind of collector would that be then? A "strange bean" collector? A "fuzzy pictures of royalty" collector? A few years ago an American woman sold a toasted cheese sandwich for $28,000 because it had the face of the Virgin Mary on it! We read this in The Week April 2011 Congratulations to the MESSENGER! MESSENGER is as big as a fridge, it weighs 1.2 tonnes, and it's the first space probe to orbit Mercury - the tiny planet closest to the Sun. In the 7 years it took to get there, Messenger orbitted the Sun 15 times, passed Venus twice and Mercury three times. This was to ensure it ended up in exactly the right orbit. One tiny mistake and it would have crashed into the Sun! 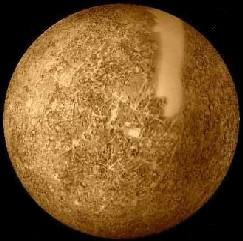 The surface of Mercury is up to 450ºC so Messenger has a very elliptical orbit - which means it swoops low to take some photos then flies out again to cool off! We love it. 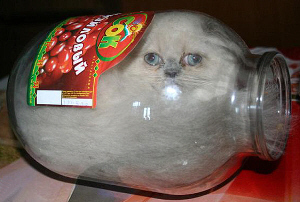 That's the nickname given to this Himilayan kitten who likes squeezing itself into jars! Her owner Yuriy Korotun from Moscow says her thick fur makes it looks like she's stuck, but she can get out when she wants to. We read this in The Week March 2011 Dancing with wolves ...NOT! Big respect to Walter Eikrem, a 13-year-old Norwegian boy, who found himself surrounded by four snarling wolves on his way home. He remembered his mother's advice not to run, and instead called up iTunes on his mobile phone and blasted the animals with Overcome by the band Creed. The wolves turned and ran off yowling! Here are our top three silly ways of saying simple things from 2010! Bronze Medal: Ian Freed of Amazon described books as reading containers. Silver Medal: Toyota called a car a sustainable mobility solution. Gold Medal: The stockbroker J.M.Finn told their customers: We have decided to further progress a fee element. It's a sneaky way of saying: "We're charging you more money!" We read this in The Week Jan 2011 In 2008 a rare white-crowned sparrow flew 3,000 miles from America to the Norfolk village of Cley Next The Sea. It attracted hundreds of bird-watchers who showed their appreciation by collecting �378 to restore a window in the local 13th century church. To thank the little bird, its picture was included in the stained glass! A German student wanted to hang his bicycle from the ceiling, so he ordered two industrial strength magnets from the internet. When he unpacked them, the magnets snapped together crushing his hand between them. The fire brigade came to help but their axes and crowbars got stuck too! Eventually they got the magnets apart with a rubber hammer and a wooden wedge. 5 trillion digits of π! We offer our big respect to Shigeru Kondo of Japan who has calculated π to 5,000,000,000,000 digits on a computer he built himself costing �,500. It took 90 days to get the answer, although his daughter nearly crashed it by plugging in her hairdryer. People all across the world were impressed... apart from his wife who moaned about the huge electric bill! We read this in THE WEEK September 2010. DREAM ON! A man from Las Vegas has just launched the biggest lawsuit in history over an unpaid bill for some work he did. John Theodore Anderson is asking for ...wait for it... � QUADRILLION. That's �,000,000,000,000,000. Somebody should tell Mr Anderson that there's only � trillion (or �,000,000,000,000) in the whole world! Do it politely though in case he sues you! We read this in THE WEEK September 2010. It has just been announced that there are 500,000,000 people on Facebook, which is about 1/13 of the world's population! Amazingly enough, the Murderous Maths site usually has about 13 people on it which is 1/500,000,000 of the world's population. But the GOOD NEWS FOR YOU is that right now you are one of those 13 people. Doesn't that make you feel special? The benches in Yantai Park in Shandong, China have been fitted with coin slots. If you don't keep putting money in, dozens of spikes shoot up through the seat! "It's a fair way to stop people grabbing a bench at dawn and staying there all day," said an official. We read this in THE WEEK August 2010. Snake v. Alligator... guess who wins? A 4 metre Burmese python was fighting a 2 metre alligator in the Florida swamps, and managed to swallow it whole. So it looked like the python had won... until it exploded! You can be a winner too on our Snake Game! We read this in THE WEEK July 2010. The Dwile Flonking World Championships are held in a pub in Great Yarmouth. The "flonker" uses a pole to toss a beer-soaked cloth (the "dwile") at somebody else's face. Unbelievably, the local council are saying the event breaks new licensing laws and should be cancelled. HOW SAD ARE THEY? We think Dwile Flonking would be perfect for the 2012 Olympics in London... and in the meantime the Yarmouth councillors should be used as target practise. Weeee... SPLATT! We read this in THE WEEK June 2010. A Chinese man was stuck in river mud up to his waist for 11 hours. Xiao Chen had his mobile phone with him but was too embarrassed to call for help. After four hours he was spotted, but it took seven hours to pull him out... because his trousers were stuck and he refused to undo them! We read this in THE WEEK May 2010. All the gold mined in the world would fit into a cube measuring 20 metres along each side and weigh about 161,000 tonnes. But the asteroid EROS is estimated to contain about 20 billion tonnes of gold - which is well over 100,000 times more! We read this in THE WEEK April 2010. Many congratulations to Jan Czugalinski from Rossendale, Lancashire who built this snow giant and then put a charity box next to it which collected �500 for the local Air Ambulance! We estimate this snowman has a volume of about 10m3 and compacted snow has a density of around 0.3 tonnes/m3, so this means he weighs about 3 tonnes! We read this in THE WEEK Jan 2010. 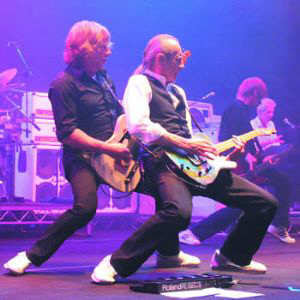 The Murderous Maths Organisation sends its warmest congratulations to Francis Rossi and Rick Parfitt of STATUS QUO who got OBE's in the New Year's Honours. 45 years together, 118 million records sold, masses of unpublicised charity work, 4,000,000 miles on the road... the facts are staggering! When we're bashing a few numbers around, there's nothing that keeps the energy going more than the Quo blaring out of our office speakers. Well done gentlemen and many thanks. Click here to hear the chorus OR download it! The pier at Southwold, Suffolk has a brilliant arcade of specially made games including the hilarious virtual dog walk and the amazing water clock. Little bankers in suits come out of holes and you whack them back down with a mallet! We think it's the most joy you can buy for 40p. We read this in THE WEEK Dec 2009. A British man who stole VIRTUAL GOODS from the online fantasy game Runescape has been arrested (for real) and cautioned! Police have identifed over 1,000 hackers who break into players accounts and steal gold, swords, hammers and then sell them for real cash. Apparently 2m worth of pretend gold is worth about �on the black market. We found this in The Week December 2009. Saved by Sums! 15 year-old Vicki Alex had been very ill and in a coma for weeks. Her parents had spent days chatting to her about her friends and tv shows to try and bring her out of it, but with no result. As a last attempt her father turned to Vicki's favourite subject - mental arithmetic! He started by giving her the very simplest sums and to his delight she managed to mutter some answers and recover. We're delighted too Vicki - very best wishes from all of us. We found this in The Week November 2009. The Mystery Face! An Ikea store in Glasgow has a wooden toilet door with its own face! Some people think it could be Christ, or Gandalf from Lord of the Rings, or even Benny from ABBA. However Murderous Maths fans will recognise him immediately! We found this in The Week November 2009. The British Royal Mail is having to apologise to some customers because their letters have been eaten by slugs and snails ! The recent warm wet weather has boosted the numbers of molluscs, and many of them have started to live in post boxes, and they find the glue on envelopes irresistibly tasty! We read this in The Week October 2009. The Biggest Garden Wall in the World! Plans have been published for a stone wall 900m high to be built in the village of Mathon, Herefordshire. 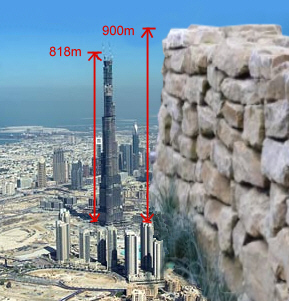 This would make it the tallest structure in the world, easily beating the 818m Burj Tower in Dubai. Sadly the planners missed an "m" out by mistake and the wall is only meant to be 900mm high, to go with a new tool shed. We read this in The Week Sept 2009. It's time to celebrate 123456789 ! 12:34:56 7/8/9 Many thanks to Maria Sanchez in North America who pointed this out to us. Of course our US friends had their 123456789 date on July 8th because they write the date as mm/dd/yy with the month before the day. Our big respect goes to Jeffrey Lawal-Balogun who was spotted by a talent scout while he was running to catch a bus! The 23-year-old is now ranked at 7th in the UK over 60m and hopes to be in the 2012 Olympics. "And the funny thing about the bus," says Jeffrey, "is that I missed it!" Barbie dolls earn $3.3bn every year, three dolls are sold every second and there are more Barbies in the USA than people. If Barbie was a life size woman, her legs would be about 50cm too long, her neck would be 8cm too long and her feet would be so small that she would never be able to balance on them. We read this in The Week March 2009 Who is Prawo Jazdy? Police hunting for Ireland's most dangerous driver have finally uncovered his identity. Computer records show that "Prawo Jazdy" had clocked up 50 different traffic offences, but each time his licence had a different address. It turns out that Prawo Jazdy is actually Polish for "driving licence" and officers had been writing it down thinking it was a name. They look so smart in their uniforms that all French school kids might have to go back to wearing them! Curiously the MM author Kjartan Poskitt is booked to do a show there in March, but he's such a mess, will they let him in? Urgum the Axeman sends his respect to Torvaid Alexander of Edinburgh. He went to a New Years Eve party dressed as the Norse God Thor with armour and a helmet made of tin foil. When he got home he found a burgular in his house so he charged at him. The burgular was so scared of the God of Thunder that he threw himself out of a first floor window to escape! We read this in The Week Jan 2009 A good reason to have a PARTY! If you bought $1,000 of shares in Delta Airlines last year, they are now worth $49. $1,000 shares in AIG are now worth $33. $1,000 of shares in Lehman Brothers are now worth NOTHING! BUT... if you bought $1,000 of canned drinks, the aluminium in the tins is now worth $214. We read this in THE WEEK Nov 2008. If all the 130 million sausage rolls sold by GREGGS the Bakers in a year were laid end to end, they would reach from their head office in Newcastle, England round to Sydney, Australia. There are about 10,000 trillion ants on earth! That's 10,000,000,000,000 ants!. This is about 1,600,000 ants for each person which is enough to completely cover everybody's body 3 times over. We read this in The Week Aug 2008 The Oldest Plant in the World! Scientists have grown a date palm plant from a seed that was almost 2,000 years old. The seed was discovered in an ancient Dead Sea fortress where it had been preserved by the heat and dryness. When the seed was formed, Queen Boudica was still fighting the Romans! We read this in The Week June 2008 The Real Dancing Queen! The pop group ABBA still sell 3,000,000 records a year even though they split up 26 years ago. What's more, one of their fans is the QUEEN! At a recent party at Windsor Castle, Her Majesty heard the song Dancing Queen come on and made her way to the dance floor. "I always try to dance when this one comes on," she explained, "because I am the Queen and I like to dance." Beware! Computer keyboards can have five times more dangerous bacteria than a lavatory seat! This is due to people eating while operating computers, and not washing their hands. YUK! We read this in THE WEEK May 2008. 89% of children who play the flute are girls. 81% of children who play the electric guitar are boys. Do you want to boost your maths skills? Then play... SNAKES AND LADDERS! This was tried on volunteers in Pittsburgh, USA and after just three 20 minute games they were scoring much higher on number tests! Just be careful if you're playing with Riverboat Lil and Brett Shuffler! We read this in THE WEEK April 2008. More than a quarter of UK adults struggle to add up prices in their heads and 47% of them wish they had learnt more maths at school. We believe it! Look what Prime Minister Gordon Brown was secretly reading while Alastair Darling was delivering the budget. If only they'd done their sums properly in the first place! We read this in THE WEEK March 2008. When the UK Revenue and Customs lost two CDs with millions of people's private details, they decided to spend �500,000 on a new slogan to fill us with confidence. After weeks of meetings and "brainstorming" days they nearly went for a fluffy pink logo saying THANK YOU, but instead opted for the much groovier HMRC AMBITION. Isn't it a relief to know our tax and VAT isn't wasted? We read this in THE WEEK Feb 2008. It's amazing where the MM books turn up. Recently a copy of NUMBERS The Key To The Universe was used to entertain an inmate in St Helena Prison in the middle of the South Atlantic Ocean! Many thanks to the glorious Mrs Pam Garnett for letting us know! A 6ft giant octopus in Newquay's Blue Reef aquarium has fallen for a Mr Potato Head toy. He was given it for Christmas and won't let it go! A German policeman handcuffed a teacher during a safety demonstration - and then found he'd left the key at home. While he phoned for help, the class of 6 and 7 year olds applauded wildly. Wahey! We read this in The Week Dec 2007 LOOSE CHANGE! There are �,000,000 worth of 1p coins lying around lost at the bottom of ladies handbags, and �,000,000 worth in UK gutters! In total the Royal Mint made 651,000,000 new pennies last year. 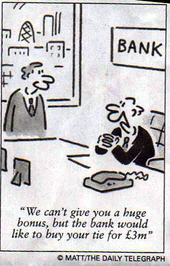 We read this in The Week Nov 2007 Have you got �0,000,000 to spend? About �billion of vouchers were given as Christmas presents in 2007, but shops estimate that 25% of them will never be spent. Make sure you use yours! WHO MADE ALL THE FLIES? We read this in The Week Nov 2007 The RICHEST British person of all time is... ALAN THE RED! He was a knight who came over with his uncle William the Conqueror and massed up the equivalent of � billion! That's four times as much as Lakshmi Mittal, the richest person alive in Britain now. We read this in The Week Oct 2007 Britain's 17,000,000 computer mice move a total of 133,000 miles in an hour which is the same as going round the world about FIVE times! The top picture shows the French President Nicolas Sarkozy on holiday. Underneath is how the same picture appeared in the magazine Paris-Match. Apart from the changes in colour - can you see a difference between the two pictures? Hint: the bloke who owns Paris-Match is one of the president's best friends. Where's the fat bit hanging over the back of his trousers gone? We saw this in The Week September 2007 The 3m diameter GARDEN CLOCK! In the seventies the 100-year old clock at London's St Pancras Station was smashed to bits in an accident. Our huge respect goes to Roland Hoggard who collected all the pieces and has since rebuilt it and attached it to his barn! St Pancras are now copying it to make themselves a new clock this year. We read this in The Week August 2007 26% of men say they would not date a woman with 2 or more cats. 36% of women would not date a man who shared his bed with a pet. 48% of women would not date a man who owned a spider. And there's one woman we know who would not date a man who owned a Deluxe Burger Bar. "Every time a Conservative MP leaves to join the Labour party, there is a small increase in the average IQ of both parties." We offer our huge respect to the journalist (and Conservative) Matthew Parris for this lovely example of how maths can be used for a bit of top quality affrontery! Congratulations to last week's LIVE EARTH concert (7th July 2007). It must have been the greatest ever pop concert since the week before when we had the Princess Diana Concert, and that must have been the best concert since... oooh ... the week before when we had the Glastonbury festival. Riverboat Lil's CHASE THE KINGS game. As Margaret Thatcher discovered, one of the main problems you have to deal with when you give up being prime minister is that you've completely forgotten how to dial a phone number. For the last ten years, if Tony Blair wanted to talk to somebody, he'd just say "Get me Veronica Gumfloss" and in seconds somebody would pass him a phone with the right person on the other end. But at least it's not as silly as the ex-USA president Ronald Regan's problem. Whenever he was being driven round in the US, they would clear the roads so that his car only needed to stop when he'd got to where he needed to be. Unfortunately he got so used to this that when he was being driven round London, everytime the car stopped at traffic lights he tried to get out. Her only problem is that it's getting expensive. Tradition says you buy drinks for everybody when you hit a hole in one, and she drinks posh champagne! Find out about chance in Do You Feel Lucky? We read this in The Week June 2007 There are 21 million CCTV cameras in the world and 20% of them are in Britain! We're sad to hear BORIS YELTSIN died. He was tough enough to stop the army taking over Russia by standing in front of their tanks and fun enough to go out and enjoy himself. He also came up with a neat version of the difference between 1 and -1 when talking about his problems to the ex- British Prime Minister John Major. JM: In one word, describe things in Russia? JM: And in two words? Murderous Maths is delighted to have helped the UK cultural secretary Tessa Jowell with her sums. The original estimated cost of the 2012 Olympics was �400,000,000. Since reading the Essential Arithmetricks Tessa has worked out it will really cost �350,000,000 which is almost SEVEN BILLION pounds more, or about FOUR TIMES as much. It's a good job she checked with us, isn't it? Remember, it doesn't matter who you are. We're here when you need us. When you buy food "Grown Locally", you've got every right to think that it hasn't travelled hundreds of miles, using up fuel and so polluting the air. Here in the UK, people living in Kent were buying sprouts at their supermarket labelled "Grown Locally". What it didn't mention was that the sprouts were driven 200 miles to a sorting plant in Birmingham, flown to Poland (nearly 1,000 miles) for peeling and washing, flown back to Birmingham and then driven back to Kent. Now we've heard that fish caught off Canada's east coast are flown to China for processing then flown back to Canada to be eaten - that's about 10,000 miles! In 1931 there were 2.3 million cars on the road and 7,000 deaths. In 2006 there were 33 million cars on the road and only 3,150 deaths. Bill Gates gets 4,000,000 emails a day! 10% of the world's population relies on the River Ganges for water. The EMMA MAERSK cargo ship (also known as SS SANTA) has an anchor weighing 29 tons. She's just delivered 11,000 freight containers of Christmas presents from China which is enough to fill a train 44 miles long! Albert Einstein's driver said that he'd heard the genius do his maths lecture so many times he could do it himself, so one night Einstein dared him to take his place. The driver fooled everybody up to the point that one academic in the audience challenged him with a really tough question. The driver coolly pointed at Einstein and replied "Huh! That's so easy, my driver could answer it." We read this in The Week Jan 2007 At any one time there are almost half a million people flying on aeroplanes. TYPEWRITER is the longest common word that you can spell just using the letters on the top line of a typewriter - or any other normal computer keyboard! 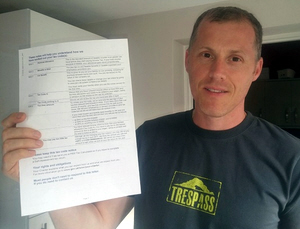 Derby City Council are trying to force him to sell his garden so they can build a road through it. When he put up a sign trying to get a bit of support they took him to court for illegal advertising. So he had a BRILLIANT idea. He has sold of thousands of tiny bits of his garden for �each, and now if the council want to build over it they have to contact every single owner, and a lot of them live abroad! WHY IS IT TRENDY TO SHOW YOUR PANTS? We're interested to hear that the European Parliament is allowing speeches to be made in IRISH from 2007 and all the EU documents will be translated into Irish too. Every extra language costs a lot more than the last one. This is the same problem as "ALIEN INTERPRETERS" in THE PERFECT SAUSAGE. But that was supposed to be a joke. This isn't. 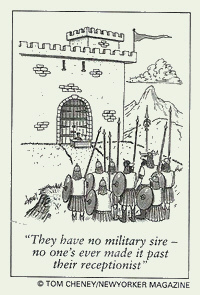 To save money, the MM organisiation suggests we remove ENGLISH from the EU parliament because we don't want to hear what all those over-fed, double-officed, expense fiddling, self-important, interfering little shunted-off failures have to say anyway. Are you listening Mr Kinnock? In a normal football match Wayne Rooney runs an average of 7.3 miles. A PEACOCK has fallen in love with a PETROL PUMP! For the last 3 years the 8 year-old bird has been walking 1/4 mile to his local garage in the Forest of Dean, Gloucester to show off his plumage. Apparently the pump makes the same clicking noises of a broody peahen when it's being used! The Japanese get through 25 BILLION pairs of chopsticks every year! Berlin's new railway station is the biggest in Europe, it cost �0m and has 30,000 passengers a day... and only has ONE lavatory! HUGE respect to LORDI from Finland who won the 2006 Eurovision Song competition with the most radical song since Boom Bang-a-bang. Obviously they got their inspriation from reading about URGUM THE AXEMAN in the the Finnish edition of Murderous Maths. We're proud to have helped. The is because the price of the copper used in the coin is worth more than the coin itself. But don't go melting them down because that's illegal! We were delighted to hear that footballer DAVID BECKHAM (we like him) buys 30 pairs of underpants every fortnight. Doubtless it's because his nice wife Victoria (we like her too) bought him a copy of The Magic of Pants and he's been practising a few tricks to entertain their three little sons, Brooklyn, Romeo and Cruz. We offer our BIG respect to Eugenie Howard-Johnson at St Saviour's and St Olaves School, Walworth, London! She's started a popular after-school club where the girls learn to rap in LATIN! We offer our huge respect to SHELLEY RUDMAN who just won a silver medal at the Winter Olympics for shooting down an ice tunnel on a tiny sledge! She first saw the sport (called "skeleton" !) 4 years ago, and in that time she trained herself up - and furthermore she got the good people of her village of Pewsey, Wiltshire to raise the �000 she needed to compete. In The Perfect Sausage we describe how you can try to break the sound barrier by skiing down a sheet of ice, but we never thought anyone would be crazy enough to take us sersiously! 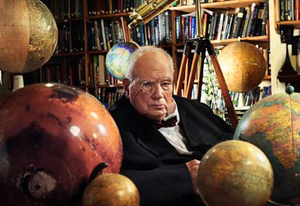 We're horrified to hear that Madame Tussauds in London is closing the London Planetarium. It's got seats you lie back in and there's a domed ceiling onto which they project the night sky with stars, planets, nebulas, asteroids and tell you all about it. It's been one of the best things in London for 50 years. So what are they replacing it with? Pictures and models of "real" stars - in other words people from soap operas and reality telly shows. By the way it costs �.99 to get into Madame Tussauds. But from the sound of it, we'd pay that much to get out. Three? Well you're wrong! Do it again and CONCENTRATE! If you don't believe us, copy the text, paste it into a word programme then do "FIND" f.
If all the lego in the world was divided up equally we'd all get 30 pieces each. So what will you make with yours? We read this lovely little fact in THE WEEK Jan 2006 HOW MANY INSECTS WILL YOU EAT IN 2006? During this year, approximately 2.7 trillion insects will be accidentally eaten by humans. That's 2,700,000,000,000 insects. Add on to this the number eaten in tv's "I'm a Celebrity Get Me Out Of Here" and it's getting to be quite a big number. We read this in THE WEEK Jan 2006 A very large man who looks like this has just come into our office and he insists that we tell our groovy mad-for-it Murderous Maths fans that the best party band in York is called HUGE. So there you are then, HUGE it is. That's the best party band in York. Please don't forget that for our sakes. Now THAT'S what we call sport. A BRAZILLION? George Bush is told of trouble with allied forces in Iraq. "Sir, three Brazilian soldiers were killed yesterday." Bush buries his head in hands and goes quiet for a few minutes. When he looks up he's very shaken. He asks: "Just remind me again, exactly how many is a brazillion?" We read this in The Week Oct 2005 An American Indian tribe are planning to build a glass-bottomed walkway that sticks out about 1200 metres (about 3/4 of a mile) above the Grand Canyon! Fancy a little walk anyone? Scientists have found this rare species of crab in the Bristol Channel that disguises itself by wearing a SPONGE on its head! If it can't find a sponge, it'll use anything - even an old flip flop. CONGRATULATIONS TO BIC - who have recently sold their 100 billionth biro. That's 100,000,000,000 pens! They've been selling on average 57 pens every second since 1950 and if they were laid end to end they'd reach the moon and back 20 times! ONE BILLION SECONDS AGO... it was the year 1974 and Abba were singing "Waterloo". ONE BILLION MINUTES AGO... it was the year 104 ad and paper was invented in China. ONE BILLION HOURS AGO... it was the stone age. A Bad Time to be Rude About Food! London won the Olympic bid over Paris by just FOUR votes. Just before the decision was made French President Jacques Chirac said Britain had the worst food in the world apart from Finland. Whooops! Finland has 2 olympic committee members. What a shame if we were to find out they voted for London rather than Paris because of that remark - because a bit of simple maths tells us that otherwise it would have been a draw! Jacques himself once told a few smaller EU countries: "You missed an excellent opportunity to shut up." "Thank you so much, Murderous Maths" say the happy couple. Poor Charles and Camilla. After all their other problems, they've suddenly had to move their wedding to April 9th - not realising it would clash with the planned publication of the latest MM book! Therefore to make sure all their chums turn up to the service rather than spend the day queuing in bookshops, we've moved our publication date to May 20th. The total weight of insects eaten every year by spiders is more than the total weight of humans in the world. It has 30 billion working parts, its memory is about 4,000 gigabytes, it handles 86,000,000 bits of data every day via a data bus operating at 40hz. It processes 100,000 pixel images in focus at 25 frames/sec in 2,000,000 colours... so wouldn't you like to have one? and up to 0.45 grammes of FAT! So if you got kissed 2,222 times, your weight could go up by 1 kg. We read this in The Week A Poorly Parrot? Nelson the parrot was taken to a vet for �0 worth of tests to find out why he had a really nasty cough. It turned out that Nelson had originally lived in an old people's home, and was copying all the sounds he had heard there, which also included lots of moans and groans! We read this in The Week How to make �9,999.50 profit on a pair of pants. 1/ Buy some little gold "hot pants" for 50p in Portobello Rd Market, London. 2/ Ensure that Kylie Minogue (a small Australian pop singer) wears them while being filmed. 3/ Put the pants in a bullet-proof box in an Australian museum and insure them for �000,000. This is a true story from The Week in Jan 2005. And as we're not entirely sure how Miss Minogue's glorious singing voice has caused the value of her pants to rise so dramatically, we're going to have to study them very carefully. The Guardian newspaper got 14,000 of their readers to send personal letters to voters in Clark County, Ohio, USA telling them why they should not vote for George Bush. Unsurprisingly they received back tons of letters along the lines of "...we aren't interested in your limp-wristed, knocked-kneed, bed wetting, tea-sipping opinions." Nevertheless, one of the Guardian staff who thought up the idea put a message on the Guardian website saying "this is probably the most important thing I've ever done at work." We offer our HUGE LOVE AND RESPECT to the US person who replied "Don't sell yourself short kid, people need coffee too." The World Mobile Phone Thowing Championships! He's a retired property developer who turned down �000,000 for a field he owned, because he wanted the local youth football club to play on it instead. Good man. who just died peacefully aged 89. He was the world's expert in putting out massive oil rig fires. He was about as near as we'll get to having a real superman. it's like comparing one second with 300 million years! We read this in The Week March 2004 The average British person spends 25% of their waking hours either on the phone, using email or sending texts! We read this in The Week May 2004 A SERIOUS FAN! Mike Bromfeld was was 17,000 feet up Mount Everest when he heard that his football team Yeovil Town were in the play-offs against Hull. He immediately hiked for 72 hours through a blizzard to an airstrip, caught a plane to Kathmandu, flew on to Heathrow and rushed to Somerset to watch the match. Yeovil lost 2-1. When you buy your ticket you throw 6 normal dice, and pay �for every spot that's showing - so you could get in for � The good news is that if you throw six sixes they let you in free and give you a chocolate eclair! a DIAMOND the size of a PLANET! It's 2,500 miles across and weighs over 2,000 trillion trillion tons! The bad news is that it's 3,300 light years away at the core of a white dwarf star in the constellation of Cepheus. Er... surely everybody has a 100% chance that they'll die? who just won 3 Brit awards. They have weird hair, bizarrely out-dated clothes, and know how to enjoy themselves. Therefore if the music business had failed them, the top rockers from Lowestoft could so easily have been Pure Mathematicians. We love them. The REAL Truants! The government recently had a debate on truancy in schools. 639 MPs didn't even bother to turn up (that's a truancy rate of 97%), and out of the 20 that DID bother, eight of them sneaked out early! are planning to run against President Putin in the March elections! The rules says that candidates have to be over 35, but Yulia is 18 and Lena is 19, so added together that makes 37 - therefore they claim that they qualify! Isn't it cheering to know that this is what two of the most important people on the planet are called! Apparently that's how the bureaucrats refer to the President Of The United States and his wife who is the First Lady Of The United States. DON'T PANIC! It turns out this was a fake fact put on the internet years ago, just to see how many people believed it. In fact spiders aren't silly, and they would take great care never to walk or fall into the mouth of anything that might eat them! And even if you WERE sleeping on your back and a wriggling spider DID happen to fall in, you'd immediately cough it up! The UK National Lottery has just had its ninth birthday. The luckiest number has been 38 which has been drawn 150 times. But the UNLUCKIEST number -only drawn 91 times - is 13! See the MM guide to the lottery odds. We're sorry to see you go, even if you flew faster than a rifle bullet. However the fact that really interests us is that for EVERY passenger that ever flew on you, it cost taxpayers about �00. So we've all paid a lot of money just to make sure a few millionaires weren't late for lunch. We read this in The Week Oct 2003 STARS and SAND! There are ten times MORE stars in the night sky than grains of sand on all the world's beaches and deserts! Apparently with a good modern telescope, the number of stars visible in the sky from Earth is about 70 sextillion, which is a 7 with 22 zeros. Of course this is only a tiny number compared to the total number of stars in the universe! THE ATKINS DIET! 3,000,000 people in Britain are on the "Atkins" diet. 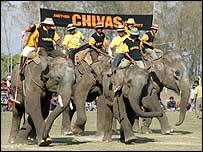 If they each lose 5kg, that makes a total weight loss of 15,000 TONNES! Bob Hope: The legendary 100 year old comic died recently. "A bank is a place that will lend you money just so long as you can prove that you don't need it." "I grew up with 6 brothers. That's how I learnt to dance, waiting for the bathroom." The singer Max Bygraves has had his records banned from a charity shop in Canterbury because they are impossible to sell. "A lot of my fans are with us no more" admitted Max who is aged 80. It seems a weak excuse because sales of the MM books are growing every week and the author is aged 107. The exact weight of a kilogramme is measured against one very special kg weight which was made in England out of platinum-iridium back in 1889, and ever since it has been kept in a sealed vault in Paris. BUT... over the last 114 years it's got lighter thanks to microscopic surface abrasion. (Don't ask us what that is because we don't know.) The difference is similar to having a 1kg bag of sugar and removing a single grain. So if you buy a bag of sugar and find a grain missing, you know who to blame. Big respect for schools on the Isle of Wight who have found a diabolical way to deal with troublemakers! They make them ride on a bright pink school bus with no heating, small hard seats crammed together and... it only travels VERY VERY SLOWLY! A Croatian teacher who went missing for three days was found trapped under a pile of books. He had been reaching for an ALGEBRA book when his entire bookshelf came crashing down on top of him. We offer BIG RESPECT to the University of Bradford! They spent �,000 and waited 3 months for a team of experts to think of a groovy new name for them. In the end they were given 3 choices: "University of Bradford", "The University of Bradford" or (wait for it...) "Bradford University".